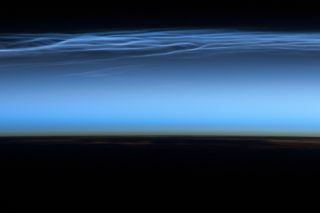 Step outside this summer to try to see strange, blue noctilucent clouds in the upper latitudes. Earth's polar skies have shined with eerie blue-white glowing clouds slowly twisting and undulating in the twilight sky every summer since the late 19th century. These mystifying clouds are referred to as night-shining or noctilucent clouds. Such clouds form in an upper layer of the Earth’s atmosphere called the mesosphere during the summer and can be seen from the high latitudes on Earth. This table shows possible sighting periods for noctilucent clouds in certain areas of the world. The fourth column represents the number of minutes after sunset skywatchers should start looking for the clouds. A series of massive eruptions from the Krakatoa volcano in late August 1883 may have serendipitously helped to draw attention to the phenomenon of noctilucent clouds. Dust and ash injected high into the atmosphere from the Indonesian volcano caused spectacular and colorful sunsets worldwide for several years. On the evening of June 8, 1885, T. W. Backhouse was admiring one such beautiful sunset from Kissingen, Germany, when he noticed something rather strange: as darkness deepened and the ruddy glows faded, he noticed wispy bluish-white filaments seemingly glowing in the north and northwest sky. At that time, scientists dismissed this effect as some curious manifestation caused by the volcanic ash. But after a few more years, the ash settled and the vivid sunsets induced by Krakatoa faded. And yet the noctilucent clouds persisted. There is some debate suggesting that Backhouse was not the first to describe the clouds, since in a report dated from 1854, Thomas Romney Robinson, in Armagh, Ireland, communicated his personal observation of the "phosphorescent properties of ordinary clouds." So it might be that Robinson was making a reference to noctilucent clouds 31 years before Backhouse. Ice crystals in clouds need two things to grow: water molecules and something for those molecules to stick to — dust, for example. Water gathering on dust to form droplets or ice crystals is a process called nucleation. It happens all the time in ordinary clouds, which generally appear at altitudes of up to about 9.5 miles (15 km) and get their dust from sources like desert wind storms. But it's all but impossible to push wind-blown dust all the way up into the mesosphere. So scientists speculate that the dust associated with noctilucent clouds could originate from outer space. Every day, Earth encounters millions of meteoroids, which have been shed by comets. While some of this material rams into our atmosphere in a flash to produce the effect of a shooting star, other tiny particles remain aloft. As for the source of the water vapor necessary to produce clouds at such extreme altitudes, upwelling winds during the summer are capable of carrying water droplets from the moist lower atmosphere toward the mesosphere. That's why noctilucent clouds only appear during the warm summer months. The clouds consist of tiny ice crystals about the size of particles in cigarette smoke. While reports of noctilucent clouds from Europe and Russia date back to the late 19th century, the first observation from North America did not come until 1933, probably because most were not specifically looking for them, or if they did see them, they didn't realize what they were seeing. Observers have been able to draw some interesting conclusions from observing the clouds over the past 75 years in North America. The earliest and latest sightings are, on average, April 1 and Sept. 28, respectively. Peak activity comes around July 20, about one month after the summer solstice. Ninety-two percent of the displays are observed during June, July and August and 82 percent are observed after the summer solstice. Before the solstice the clouds tend to be faint and cover small areas of the sky, whereas after the solstice they are usually brighter and more extensive. In general, it would seem that the best times to look for them are during July and August. As to what you're looking for: gossamer, electric-blue clouds, resembling luminous tendrils, spreading across the northern to northwestern sky and slowly twisting and rippling in the twilight. A case for global warming? Over the last few decades, noctilucent clouds seem to have been increasing in frequency, brightness and extent. A century ago, for instance, the clouds were confined to latitudes above 50-degrees north. Observers would have to go to places like the United Kingdom, Scandinavia and Russia to see them. But in recent years, they've been glimpsed as far south as Colorado, Utah and Virginia. It is theorized that this increase is connected to climate change. "Extreme cold is required to form ice in a dry environment like the mesosphere," said Gary Thomas, a professor at the University of Colorado. Surprisingly, global warming helps. While greenhouse gases warm Earth's surface, they actually lowertemperatures in the high levels of our atmosphere. Satellites have helped scientists study these clouds. In September 2009, the United States Naval Research Laboratory (NRL) and the United States Department of Defense Space Test Program (STP) conducted the Charged Aerosol Release Experiment (CARE) using exhaust particles from a Black Brant XII suborbital sounding rocket launched from NASA's Wallops Flight Facility to create an artificial noctilucent cloud. The rocket's exhaust plume was widely observed and reported from New Jersey to Massachusetts. Other evidence indicates that at least some noctilucent clouds resulted from freezing water exhaust from NASA's retired space shuttle fleet. In fact, the clouds were observed and photographed by astronauts from orbiting spacecraft.